Large crowds followed Jesus wherever he went, bringing their sick friends and relatives to be healed. On this day as he was leaving Jerusalem, he was again accompanied by a crowd of people. The blind man's friends told him to be quiet, but he called out even louder to Jesus. Jesus stopped and told his disciples to call Bartimaeus over to him. They said to him, "Cheer up! On your feet! He is calling you." He threw off his coat and came to Jesus. Jesus asked him what he wanted, and he said, "Rabbi, (meaning 'teacher') I want to see." Jesus said, "Go, your faith has healed you." 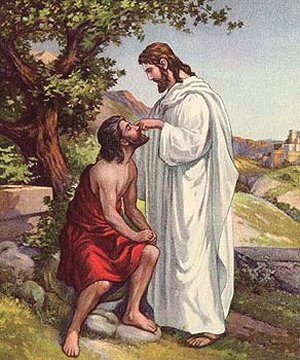 Immediately, he was able to see, and he followed Jesus. What a happy day in the life of this blind man who had believed in the healing power of the Son of God! The blind man in the story was persistent. He did not give up. He called out again and again. He would not stop until he could talk to Jesus. One time Jesus told the story of a widow who had not been treated fairly (Luke 18:1-8). She kept coming back to the judge until he gave her what she wanted. Has someone treated you unfairly? Talk to God about it, and don't give up. He will help. Do you need help with a problem? God wants to hear from you. He loves to hear your voice talking to him. English Bible Activities Select story #217 in the list for activities to accompany this Bible story. Spanish Bible Activities Select story #217 in the list for activities to accompany this Bible story. 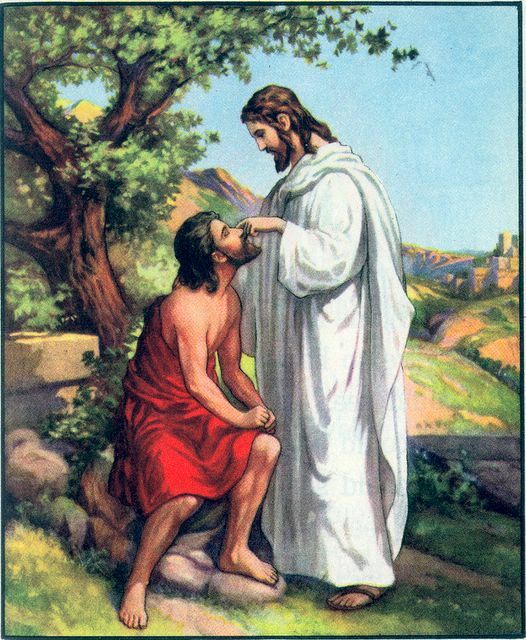 Press "Go" to search for books about Jesus Heals the Blind Man. i feel this has has helped me in so many ways to enrich the younge minds in my class in a way the understand. This page displayed 227,729 times.